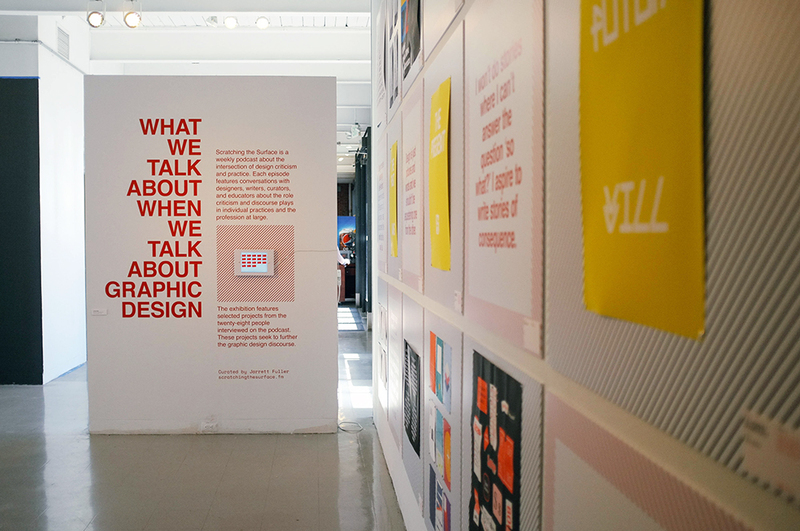 What We Talk About When We Talk About Graphic Design is a multi-platform project interested in the intersection of design criticism and practice. 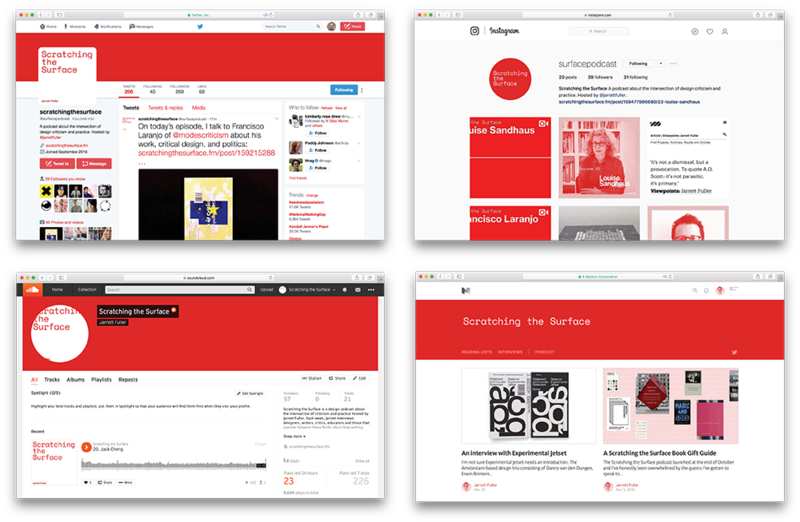 Through a weekly podcast called Scratching the Surface, I interviewed designers, writers, critics, educators, and curators about the role of design criticism, writing, and discourse in the design profession. By creating a survey of contemporary design discourse, the podcast seeks to find new ways to talk about graphic design. This content was then expanded into books, an online publication, and an exhibition of critical graphic design. Scratching the Surface is weekly podcast about the intersection of design criticism and practice. New episodes are posted every Wednesday to the Scratching the Surface website, scratchingthesurface.fm. Over the course of the year, I interviewed 30 people from around the world and working in diverse fields from design practitioners, educators, architecture critics, technology writers, and curators. Episodes are available to download from iTunes and delivered to all major podcast platforms. Additionally, social media accounts — Twitter, Instagram, Medium, and Soundcloud — were created to promote the podcast, build an audience, and post additional content that was created around each episode. 30 second to 1 minute clips of each episode were created and animated that were posted on Twitter and Instagram each week as another entry into each episode. Inspired by the podcast, I curated a small exhibition of work from the guests that sought to further the graphic design discourse. 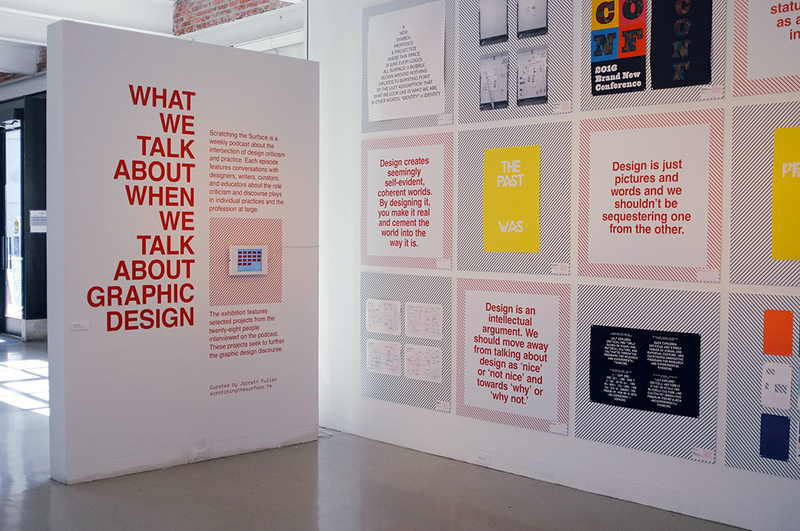 The exhibition featured a selection of contemporary critical graphic design from designers like Francisco Laranjo, Dexter Sinister, Armin Vit, Louise Sandhaus, Google Design and Experimental Jetset, as well as select quotes from the interviews, to create a survey of contemporary design criticism. An iPad with clips from every episode of the podcast was included on the first wall before leading into the full exhibition. 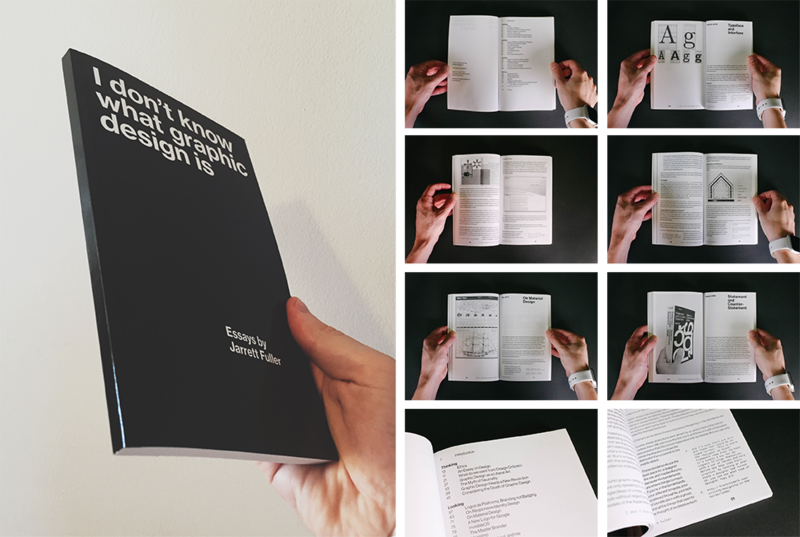 I Don’t Know What Graphic Design Is an edited collection of my own essays about design from the past five years. Consistent themes that emerged in my own critical thinking include branding, interface design, and authorship. 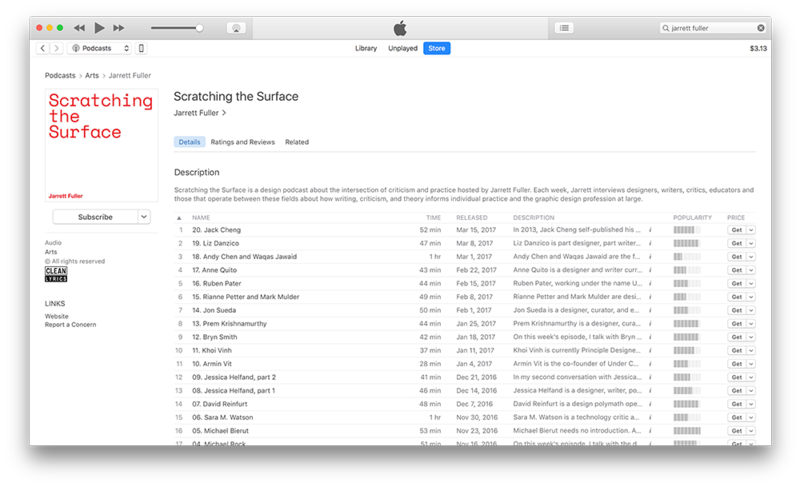 To celebrate the first season of Scratching the Surface, I produced and edited a collection of essays written by the guests from the first eleven episodes. Two essays were selected for each episode — one from the guest and one from a writer who’s influenced that guest’s own writing — created a chain of influence to map ways of thinking about design criticism.